Playing rugby opens doors to a world of opportunity. A career in the sport brings with it opportunities to travel the world, to meet new people and to make a difference. While some choose to close that door behind them once their time is up, many continue to knock others down. Since retiring from the game in 2014, Grace Davitt has recognised that she must make the most of anything that comes her way while she still can. For the former Irish centre though, it is all about giving back. Since her retirement, Davitt has worked tirelessly to develop the women’s game in Ireland. This work will now stretch further afield when she travels to Laos in South-East Asia as a representative of 100 World Legends, an organisation that comprises many former international players who support a number of different charities across the globe. Following an impressive career for both Ulster and Ireland, Davitt was contacted by 100 World Legends to join the Irish contingent of participants that includes former Irish internationals Paddy Johns and David Corkery. Through its link with Pass it Back, an Australian-based Sport for Development programme that uses rugby to equip young people with important life skills, Davitt continues to make an impact akin to her robust playing style. Having been part of the 2013 Grand Slam success before Ireland’s World Cup adventure in 2014, Davitt chose to retire from the sport when it was arguably at its highest ebb in the country. 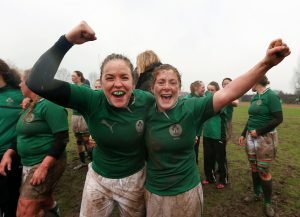 A member of the first Irish senior side to defeat New Zealand, it might have been assumed that she would continue to contribute to Ireland’s rising fortune. Alas, enough was enough. “My body was done. I took a lot of knocks over the years – several serious hip and knee injuries; so, the way I see it, I was lucky to play at such a high-level at all. I carried on training after my retirement and I suppose I could have played on, but the injuries took their toll and I had to opt for reconstructive surgery on my knee. I’ve been told that I’m never going to play again at any level, so that’s that. 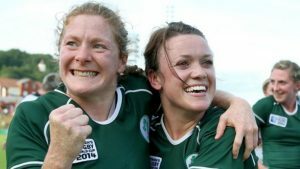 While her boots may no longer be required, Davitt continues to play an important in the development of the game in Ireland in a variety of guises. For instance, the 2017 Women’s Rugby World Cup reached an unprecedented digital audience with Davitt’s insights from the RTE commentary box a regular feature on the clips that traversed the globe. Affording the women’s game such profile in the country for a sustained period of time is an undoubted legacy from her time in green. Upon her retirement Davitt moved straight into a coaching role with Cooke RFC while she also continued to put a lot of work into the game behind the scenes with Ulster Rugby in an effort to raise standards in the province. 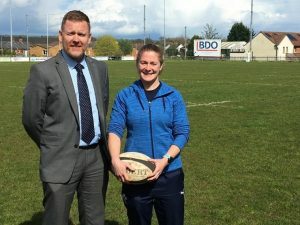 While last year was her first without any direct involvement in the game for 13 years, this season she will return to take the reins at Malone RFC whom she will attempt to guide to the All-Ireland League. Of course, it’s not the only challenge that awaits Davitt this year. In January, Davitt’s coaching skills will also be put to the test when she will travel to Laos. With the help of sponsorship raised through the coming together of former international players for exhibition games, programmes are currently being rolled out in the region using rugby as an educational tool. “As a player I learned some amazing skills through the game. It improved my confidence, I began to enjoy public speaking, I developed leadership skills and I honed the ability to work within a team. But I already had the fortune of having a good education behind me, something these children won’t have had. Learning the skills that rugby helps to develop gives them a chance of progressing in their lives. We also use it to increase their awareness of violence in their homes, on the streets, threats to their safety, women’s rights… stuff they don’t know to be any different. “It’s remarkable how even from such a young age the children want to move on from their villages and do this and that, but they appreciate that they have to grow as people first. They cling onto your every word, even though we need an interpreter. They’re eager to learn so everything you say they will want to implement. They are like sponges and want to learn as much as they can. It’s very refreshing. In Ireland, there is so much rugby that everyone has become a bit of an expert and they question the knowledge you might impart. Join for a day of golf, dinner and rugby in the company of some of the greatest names to have graced the game, whilst raising funds for the Laos Rugby Federation and My Name’5 Doddie Foundation.